"You've not been to Asio?" 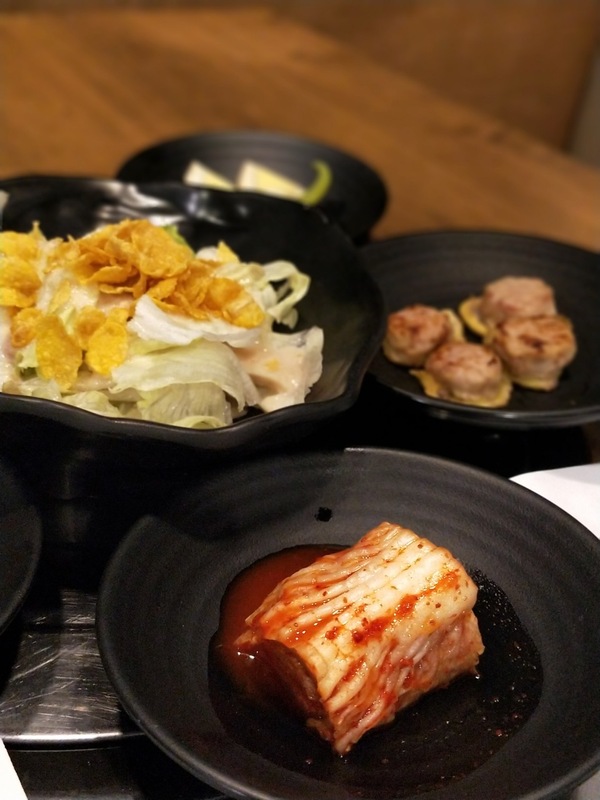 "Dude, you've not been to this new Korean place?" Usually either a scoff or an expression of disbelief or an expression of sheer I-went-before-you follows. I guess, I'm the last one to find out about this Korean 'gem.' Skeptically I looked it up on google maps and off we went. Located in an under-construction building on Greenways Road, the restaurant in the 2nd floor stands out. Brightly lit and beautifully decorated, with the in-thing in restaurant design, Aeseo is a visual treat. 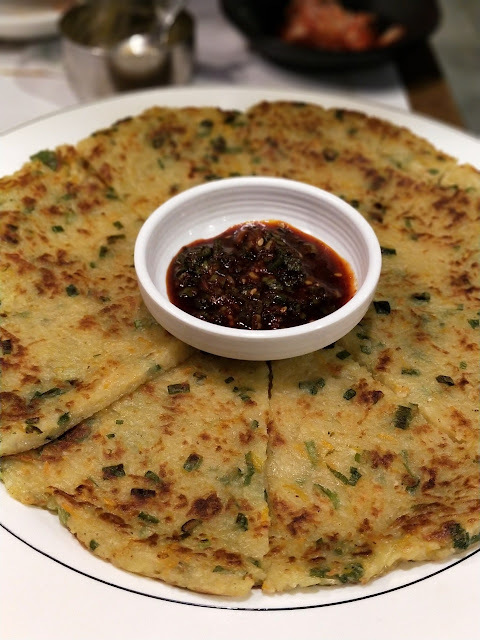 Thankfully the Koreans (at least they looked like Koreans), didn't think I was looking for masala dosa and landed there by mistake. They weren't surprised to see me, like one of my first visits to a Korean restaurant where I was told at the entrance that there was no chicken tikka masala on the menu. Either I look like a well seasoned traveler/respected blogger/foodie who knows what he wants OR there have been enough non-Koreans who have visited the place before. Considering what I've been told and the whole of Chennai seems to be aghast that I haven't visited this place earlier, the latter is probably true. 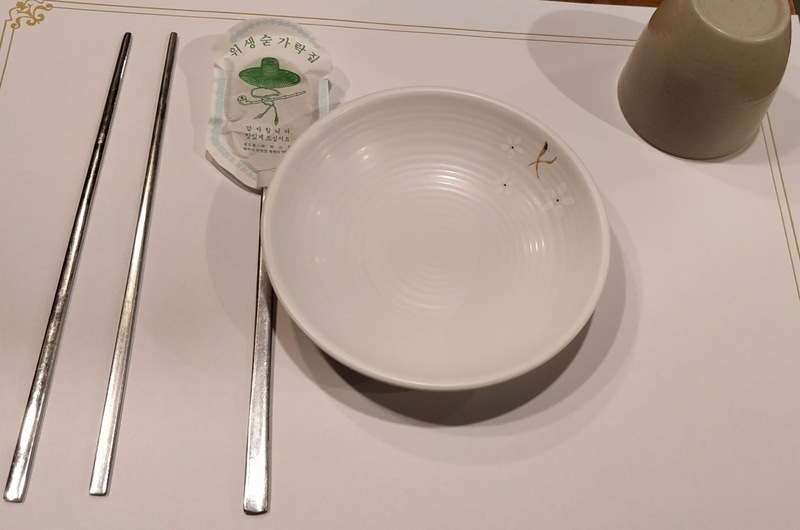 Typical of Korean hospitality, as soon as you place your order from the bilingual pictorial menu, you are served a round of starters. We got some beef cakes, lettuce salad, kimchi and boiled eggs. Munching on them was a perfect way to wait for the mains to arrive. 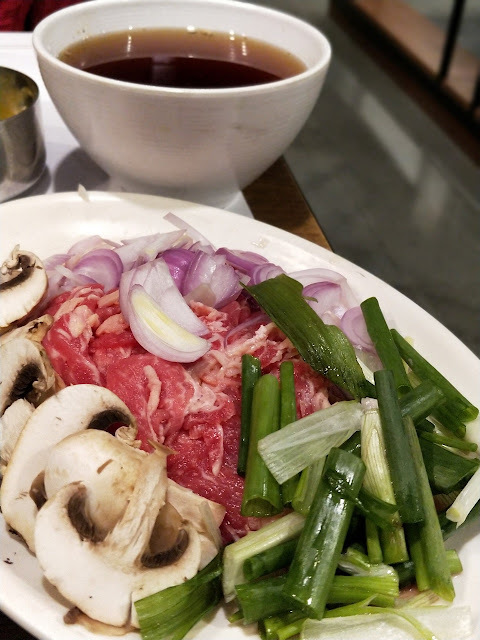 A Korean grill on the table came to life with raw beef, mushrooms and veggies. The waiter poured all the ingredients and left. Almost like clock work, he came back to switch it off and serve us melt in the mouth beef. Simply boiled meat that was succulent and flavourful. Clearly the quality of the meat was high. 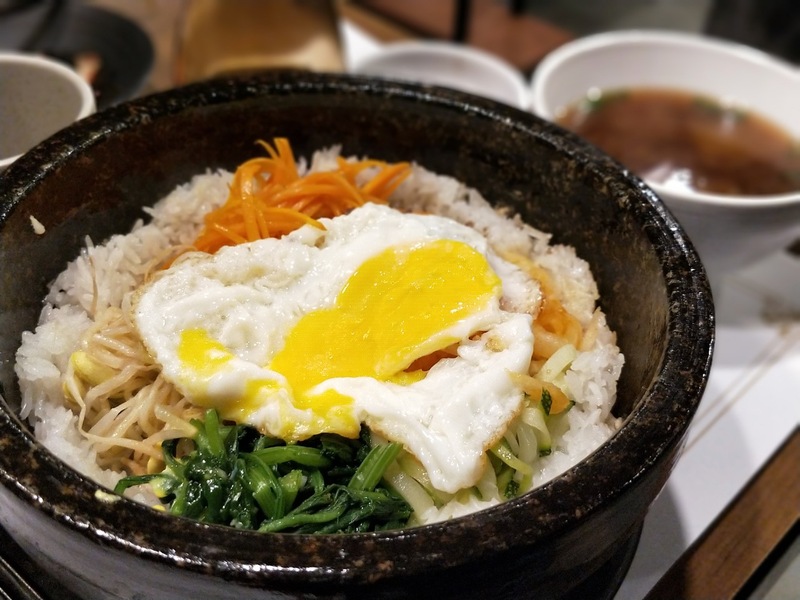 The bibimbap arrived and like everything else, was a feast for the eyes. Rice with various condiments arranged beautifully in a stone pot and served with soup on the side. Waiter, realising that we might need help, offered to mix up the rice bowl for me. While the end result was definitely not as pretty as it was served (duh), it served its purpose of being tasty. While an acquired taste for many, the distinct rice and veggies with a salty sauce certainly was nice. The pancake made with potatoes hit the sweet spot between comfort food and pushing comfort food to the brink. Nice and flavourful by itself, the red sauce added a distinct Asian flavour to this. 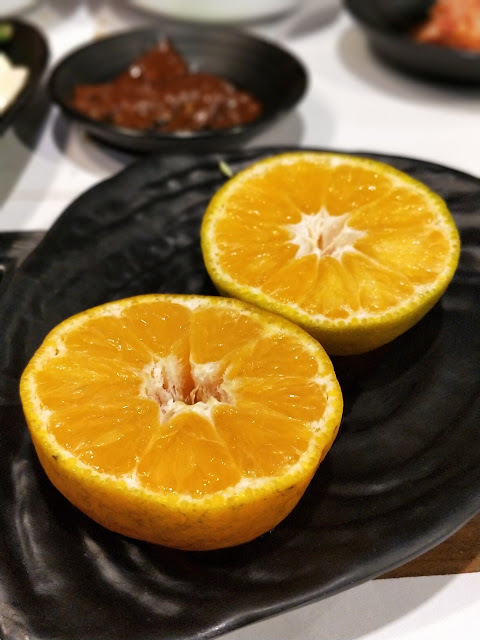 No idea why, but there is only an orange for dessert. And it is not charged. The bill was about 2700 for the above three dishes, so clearly the price of the starters and the orange has been built inside. 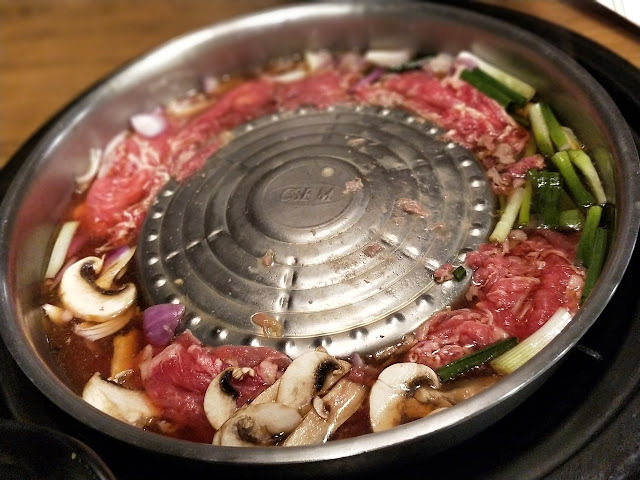 While I'm no authority on Korean food or its history, we enjoyed this new gem. 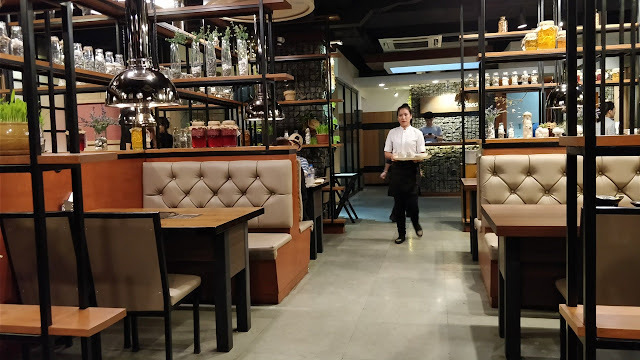 With beautiful interiors and food that is on the borderline of comfort with octopus and the likes on the menu, Aeseo is another Korean restaurant to hit the Chennai market which has a growing Korean community in it and I hope they do enough to more than survive in this market and continue to add variety to Chennai's dining scene.